Loving Enemies - Heart. Soul. Strength. Mind. This sounds like a nice enough Bible verse, right? Not really. If we fully recognize what Paul is saying here, and put it into practice, it will be one of the most difficult things we ever do. If you have a stronghold in your life, you are enslaved to whatever it is that has power over you. For many people, the strongholds are things like anger and a desire for revenge. I think these feelings reside in every human soul. It is normal to have them, but once we decide to follow Jesus, it’s time to take out these strongmen and crush them. In other words, Jesus put the lie to death. We are immortal souls! God has the whole thing under control. No worries. Think of life as a dream you’re having. So what if you or someone else wakes up a little bit before you had set your alarm clock to go off? Not that big of a deal, really. I know this sounds flippant, but keep in mind that I am not 100 percent certain that my older son is alive. This knowledge keeps me SANE. So we don’t have to hate or kill our enemies and continue the cycle that the satan would like to see perpetuated. I refuse to participate. Of course, it’s easy to sit here and talk about unlikely circumstances or wars that I am at a personal distance from. It’s another thing altogether to talk about REAL enemies — the people in our everyday lives who slander us, provoke us and do other things that make us feel like a spiritual knife is entering our heart. Our normal instinct is to STRIKE BACK, or at the very least, engage in a good complaining session about the person. But Paul says to take captive EVERY THOUGHT and bring it into obedience to Christ. So that means that if I choose to complain to my husband about someone who has hurt my feelings, denigrating them, that I am NOT being obedient to Christ. Yikes. So what to do? I refuse to give myself a pass on the grounds that I am “only human” because I’m really trying to transcend my current level of consciousness. The way that I take such thoughts captive is to implement Jesus’ command in Matthew 5:44, which says to “pray for those who persecute you.” So, whenever I am tormented by a yukky thought about another person, the only thing to do really is to pray for them. And boy do I not want to do that. But you know what? When I force myself to do so, I feel a wonderful peace. And if the thoughts return the next day, I do it again! I don’t pray that the person will see the error of their ways or anything like that. What I pray is that the person will be most richly blessed and experience God’s joy, peace and love in their lives. In other words, what I want for myself. And you know what? I get what I pray as if I had prayed those words for me rather than the person I have struggled with! This stuff is really really hard. And it’s not fun to do. And I don’t do it as much as I should. Some thoughts manage to get through in spite of my efforts to kick them back into the darkness. But it’s a journey that I want to undertake. I hate the darkness and don’t want any part of it, really. The knowledge of God is that we are one, and how we treat our brothers and sisters is how we treat ourselves. I want NOTHING to come between me and this knowledge. 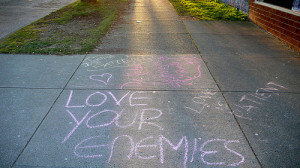 This entry was posted in Growth, Love and tagged Jesus Commandments, love your enemies, peace, pray for enemies. Bookmark the permalink. ← What Are We Swimming in — Polluted Water or Living Water? I can’t do it at all. I have to vent out my emotions and then I am willing to forgive or if not, at least move on. I have gotten rid of most of the toxic people in my life. I don’t consider them enemies, but I don’t intend to build any bridges with them. I don’t think we need to build bridges with a lot of situations. A lot of times, it’s simply better that they’re no longer in our lives. I wish more people would trust the Holy Spirit!